What treasures await those who dare?? 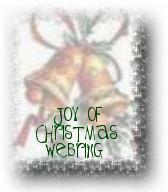 Visit with Donna and her family and explore her family friendly Holiday site. Pick a Pocket Angel, earn her Christmas award or take home her Holiday greeting card. Plus there's a bit of history, maybe some recipes and just plain old fun. A doggy can not live by bones alone. Come celebrate the holiday with Speedy and get a puppies point of view on just how the Christmas Holiday should be spent. Speedy will even teach you how to get your puppy dog to sing Christmas carols. How's that for a smart puppy dog? Now here's a fun little spot. :o) My teenage daughter Nikki has wonderful heart-warming Christmas stories that will delight both the young and the young at heart. Find out what Christmas means to her. Keep your eye open for this picture. always bring you safely back to this one stop location. owned by Donna's Holiday House. This ChristmasWebring site owned by Donna. owned by Joy of Christmas.